Beachfront Retreat with Pool, BBQ and large deck!! Drop your bags and unwind in this beach house built for entertaining and family getaways in the Cape's oldest town. Just minutes after the Sagamore Bridge and no need to drive anywhere once you're here! It's been redone in preppy but contemporary glory, on the water with a private association beach, and surrounded by conservation woods with huge backyard and gorgeous in-ground pool. Enjoy sunsets overlooking the water on our 70 foot front deck. Host a BBQ in the fenced-in backyard with plenty of room for wiffle ball and pool parties complete with fire pits. Or go down to the bar downstairs for cards or aperitifs. Sit on rockers on the farmer's porch & stare at the water over champagne. Or stroll to the beach and jump into the crystal clear water - great fishing too. -House is a family & friends memory maker....look forward to your 2019 summer blast! Nice sandy kid friendly beach at Spectacle Pond!!! Water views from most rooms in the house. Situated on Spectacle Pond one of the Cape's best kept secrets. -Awesome and large new pool (with nightlights) in closed in backyard with BBQ -Backyard has huge wiffle ball field for hours of children (and adult!) fun -Close to golf, shopping, restaurants, bars, but just far enough away -Perfect location, close to Falmouth, just over the bridge and a short ride to Sandwich town beaches -Bar downstairs has professional dart board, Texas Hold 'Em table complete with chips, Blackjack deck, a full refrigerator and kegerator. Outside the bar is the farmers porch with rocking chairs overlooking water. A perfect social gathering spot, inside and out! -Park with basketball 50 yards down the street -Huge house with areas for team and/or separate individual fun -House has space to sleep 14 easily when using inflatables and sofas yet feels cozy -Water is stocked with trout and bass and is considered a tremendous fishing spot -House is a family & friends memory maker....look forward to your 2011 summer blast! We had a wonderful week at 2 Kiahs Way! The house was beautiful and the pool FANTASTIC! Our family consisted of 8 adults, 3 teenagers, 2 younger kids and a dog! We all absolutely enjoyed our stay there! The only downsize was the internet connection! Having 3 techy sons who are very into technology the DSL just didn’t cut it! The light switches were a little funky but other than than it was wonderful and we all enjoyed ourselves immensely! Thank you for sharing your lovely home! House is beautiful and pool is great. Our only disappointment was that we believed the private lake beach property meant our pup could swim. We were disappointed to find she was not allowed as it was a private association, not private to owners. We also froze. The AC was set so low and we struggled to adjust it. We all wore sweatshirts and socks in the house, while it was 80’s outside. Fantastic location for a family retreat! 14 of us shared this lovely house and had absolutely perfect weather! The property is located in a quiet area at the end of a dead end street and has a cute beach and pond right across the road. The kids (and adults) loved spending time each day in the heated pool and then grilling our dinner on the patio. There is plenty of shopping close buy and many activities for the family if you decide to venture out. We spent a day kayaking and paddle boarding and also go-karting. The host was easy to communicate with prior to our stay and Paul, the property manager was extremely responsive when we had questions about the different light switches (They can be tricky:-) The home itself is very spacious and allowed us to have our family time together but also a chance to get some privacy if needed. The beds were very comfortable and the host provides plenty of extra pillows, towels and linens. There were also cots and air mattresses if we needed them. Star gazing at night was a favorite thing to do as the homer is set up a hill and back from the street and offers a great deal of privacy. The back yard is a great size and the kids played football or Frisbee all week. A short distance down the road, across from the beach area are basketball courts and a nice field. This home was exactly what we needed and would recommend this spot for any groups looking for a spacious property that offers comfort and tranquility. Good location and perfect for family get together. Enjoyed the heated pool! FOR MULTIPLE FAMILIES!!!!!!!! PERFECT FOR MULTIPLE FAMILIES!!! Perfect for multiple families!! 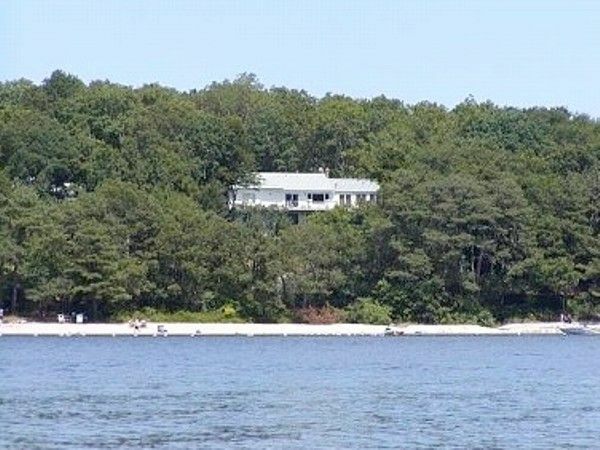 Not a ''rental property'' but a vacation home....our home....the Beach House. -Teak family table and chairs on the front deck for dinner at sunset. -Downstairs is complete with bedroom and full bath and can be separate for other family, friends or in-laws. -Water views from almost every room. Golf: Why stay in an expensive hotel??? Have access for all the guys/gals in your own house complete with bar for your most memorable golf weekend...and its cheaper with access to all of the best golf the Cape has to offer. All rentals during Summer Sunday to Sunday. Rentals during other periods commencing on different days or of different duration may be considered on a case by case basis. First come first serve with respect to bookings. Thank you very much.